The first lamb of 2017! Three weeks ago today, lambing season 2017 got underway for us! On the morning of February 19, Mae and I moved the ewes to a 5.75 acre paddock with plenty of grass and tree cover (a paddock we'd be saving for lambing). When I went back to check the sheep that evening, ewe #261 (a Shropshire ewe) was in labor with a big ram lamb (who happened to have one of his legs back). I caught the ewe, pulled the lamb, and lambing season had begun. In many ways, this first lamb was a harbinger of how lambing season would go this year. We've pulled more lambs than normal - mostly because our lambs were unusually big this year. We even had to do the first c-section in all our years of raising sheep - saved one of the lambs but couldn't save the ewe. We suspect the large lambs are due to warm weather in November and nearly double our normal grass growth this winter. Large lambs - and large litter sizes (we've had 2 sets of quadruplets and 4 sets of triplets so far) means we have more bottle lambs than normal. As I write this, Sami is mixing up yet another batch of milk replacer for the bummers. Despite these challenges, we'll take big lambs and extra labor over drought anytime! 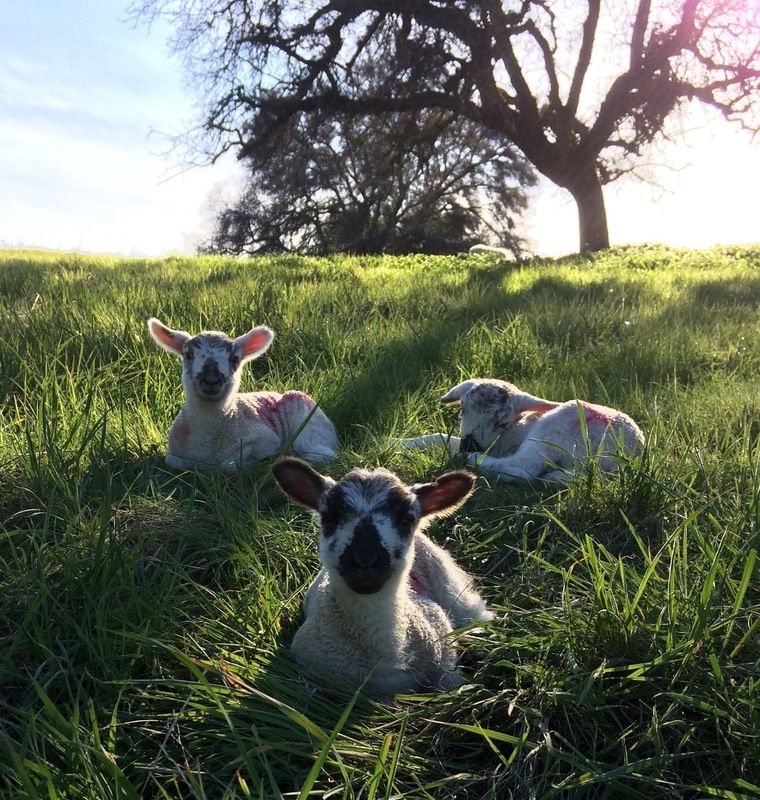 Since lambing represents the most intense labor demand of the year, we try to concentrate it as much as possible. A concentrated lambing season also means that our lambs are more uniform in size when we wean them in June (which makes them more marketable). The rams are with the ewes for approximately 6 weeks, so this marks the outer bounds of our lambing season. Usually, 85-90 percent of the ewes are bred in their first two cycles (the estrus cycle of a ewe is 17 days). This year, 95 percent of the ewes have lambed in the first 3 weeks of lambing! No wonder the rams were tired when we separated them from the ewes last November! Now we're waiting for the last 5 percent of the ewes to deliver their lambs. Judging by appearances, I expect this will happen in the next 10 days. We'll continue to check the sheep three times a day until the last ewe delivers her lambs. Every year we learn something new. This year, we took our gooseneck trailer to the leased property where we lamb during last weekend's cold storm. We had a set of twins and a set of triplets that got hypothermic during Monday's cold rain/sleet. 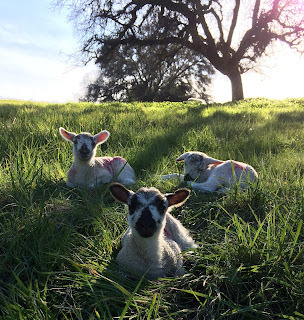 Normally, we'd have taken these lambs home to be bottle-raised. This year, we put them in the trailer with their mothers. After a couple of days of recuperating in the shelter of the trailer, they went back with the rest of the sheep. We'll keep this "tool" in our toolkit for future lambing seasons. Once lambing wraps up, we'll move on to other chores. The sheep will get moved back to our summer pastures sometime in April. In mid-April, our irrigation season begins - I'll go back to moving water once a day, every day. In late April or early May, our friend Derrick Adamache will shear the ewes - he'll come back in July to shear the lambs we're keeping. And in June, we'll wean the lambs - the final "report card" for our efforts this year. In the meantime, the sheep and I will enjoy this spring weather! A quick update! The last ewe at the ranch gave birth this morning! We have one more ewe left to lamb at the house (one of Emma's) - but our main flock lambed in the space of 23 days this year! Amazing!